Amsterdam is just a short hop across the channel, and many low cost flights make this popular City a destination - getting there is cheap and easy. The Marathon, Half Marathon and 7.5K races have proven very popular with UK runners over recent years. Starting and finishing in the 1928 Olympic Stadium there will be over 20,000 people taking part - and promises to be a great event. 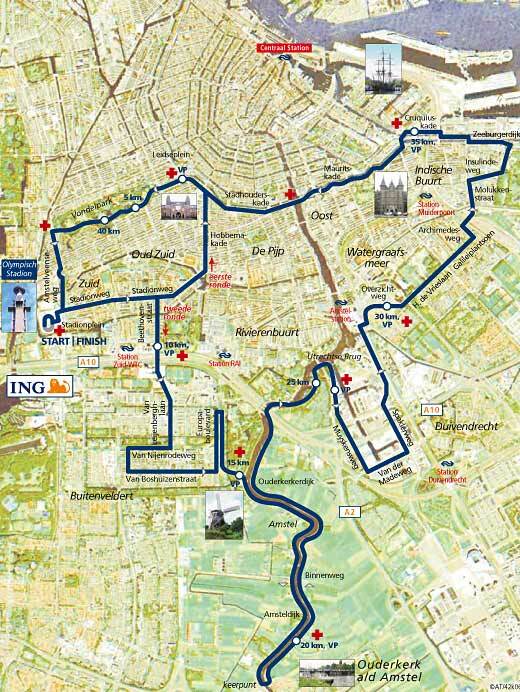 The Marathon course takes in many of the sights of the City, and is set along the River Amstel for much of the latter stages. 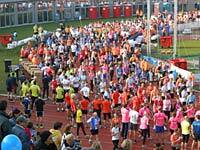 'Running Crazy' are delighted to welcome runners who are raising sponsorship for registered charities. We know that the great feeling of accomplishment when completing the race, feels even better when you are helping others in to the bargain! 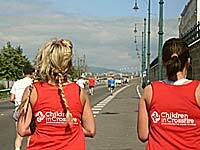 See our Run for Charity link to choose a charity that you can help. Many charities listed there will provide special runners packs including sponsorship forms and tips, and also charity running vests. Just contact them with your details and tell them you intend to run with 'Running Crazy' on their behalf. In addition we will provide you with a 'Running Crazy' Certificate confirming your achievement and result, and also a special commemorative prize. Just specify the charity name in your 'Application'. 'Running Crazy Ltd' have secured a good class hotel on a Bed and Breakfast basis at a hotel conveniently located for the race and also for your sightseeing days. The Hotel is just 50 metres from the Metro line, and a Tram route terminates right beside the hotel. The 'Running Crazy' Hospitality tent will be available for kit storage at the Olympic Stadium, but the organisers have this well covered in any event. Amsterdam enjoys a similar climate to that of the UK at this time of year. 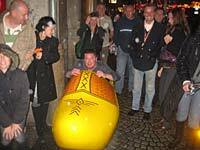 Amsterdam is unique - there is nowhere quite like it. 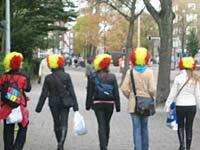 The people are friendly and nothing is too much trouble - virtually everybody speaks a good level of English. There are Museums galore in Amsterdam - 37 in total! Most famous perhaps 'The Rijksmuseum', the 'Rembrandt House', and the 'Anne Frank House'. There is a free and liberal atmosphere throughout the City. There are plenty of coffee shops and cafes where you can make time to just sit back and enjoy your free time. There is good shopping, great parks, take a canal cruise for a different view of the City. We offer a Pasta Party the night before the race, and a get together and Party after the event. We will also provide you with a City Map, some ideas of things to see and do, and a 48 Hour free Transport ticket for use on the Metro, Bus or Trams. 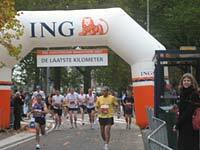 Amsterdam is a great race for a group of runners. With a Marathon, Half Marathon and 8K, everybody can be catered for. There are discounts available for large groups (20+), but even a group of just 10 will qualify for an additional prize for the first or last to finish ...you choose. If you have a group interested in joining us, just complete the Group Application Form and 'Running Crazy Ltd' will be in touch. If you are interested in taking part in this event simply complete and return the Application Form. Further details will be sent by return of E-Mail including travel tips, a full price list, and payment arrangements. Thank you Malcolm and Kipper for making the Amsterdam weekend a very enjoyable weekend. Nick and I didn't have to worry about anything apart from running the marathon and half marathon respectively. Everything was very well organised from the moment we stepped off the plane to our leaving on the monday and Malcolm and Kipper are both excellent company to be with and had obviously done their homework both with regards to the race and the pre/post race activities!! Absolutely brilliant and fantastic value for money. We will definetly be going with Running Crazy again on many more running weekends and we would recommend them to anyone who wants to run abroad, hassle free. Thanks for a great weekend. Thanks to both you and Gerry North for making our weekend so enjoyable and hassle free. Like you said when we arrived - all we had to do was run. Thanks again. 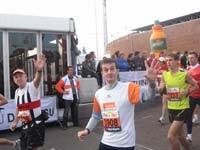 I have just returned from completing the Amsterdam marathon, my 5th event with Running Crazy, Malcolm and his staff have always been extremely helpful with their advice, and are able to rectify any potential problems expediently, will look forward to many more events with Running Crazy. Belated thanks to Malcolm and Gerry for a fantastically well organised weekend in Amsterdam. 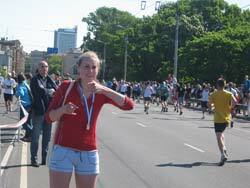 This was our first run abroad and being novice runners we were unsure of what to expect. We needn't have worried! All was taken care of, all we had to do was run! We would wholeheartedly recommend Running Crazy. Hello to everyone we met - hope to see you again somewhere! Kindest regards to Malcolm and the Legend that is Gerry North! Malcolm and Gerry, thank you very much for a fabulous weekend. All we had to do was meet you at the airport and the rest went like clockwork. 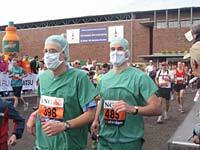 Peter and I loved Amsterdam and I enjoyed doing the Marathon. It was definitely worth going with Running Crazy and I will certainly use you again, I'm just trying to make up my mind which marathon it will be. Thank you from a very satisfied customer. Our third trip with Running Crazy, and as with the previous two perfectly organised by Malcolm to give you a stress free weekend, so all you have to do is turn up and run. Excellent hotel again perfectly situated for the race and also Amsterdam's other interesting areas. Will definitely be using Running Crazy again, just got to decide where to this time. Many thanks to Malcolm and Gerry once again for a great weekend. See you soon!